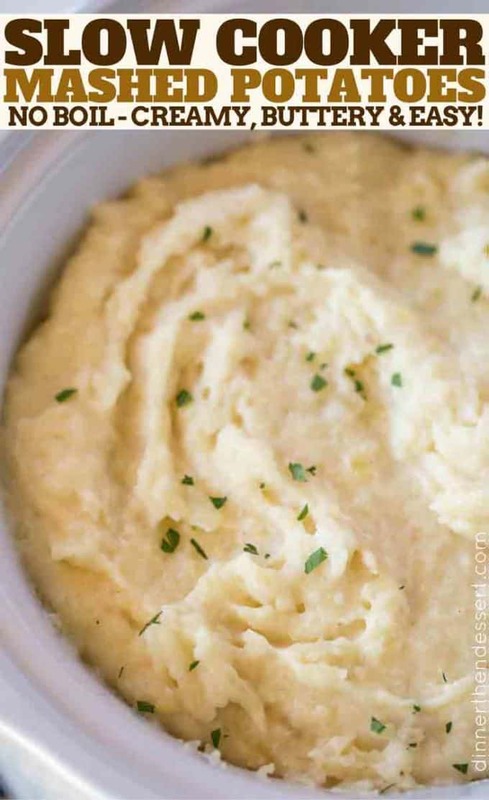 Slow Cooker Mashed Potatoes are an easy side dish (with no boiling required!) that you can make for the holidays and keep warm on the buffet without drying out! 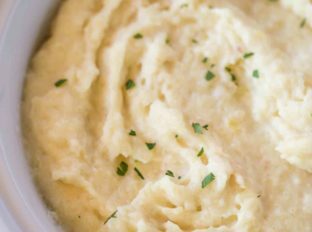 We love serving these mashed potatoes but you can also try Creamy Garlic Mashed Potatoes, Ultimate Loaded Mashed Potatoes or Slow Cooker Sweet Potato Casserole for the perfect holiday side dish! 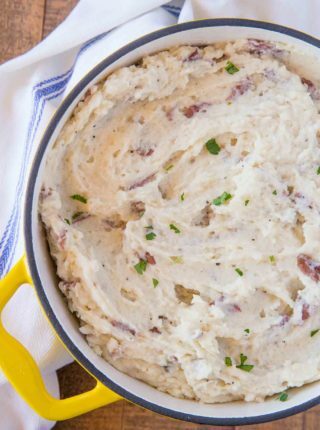 Slow Cooker Mashed Potatoes are a holiday favorite of ours since we bought our first slow cooker together. In fact, it was the second slow cooker recipe I ever made (first was: Ultimate Slow Cooker French Dip Sandwiches). The best part about the recipe is that it doesn’t need ANY boiling. It is as easy as dump and cook, then a quick mash with a potato masher or hand mixer and you’ve got delicious mashed potatoes! 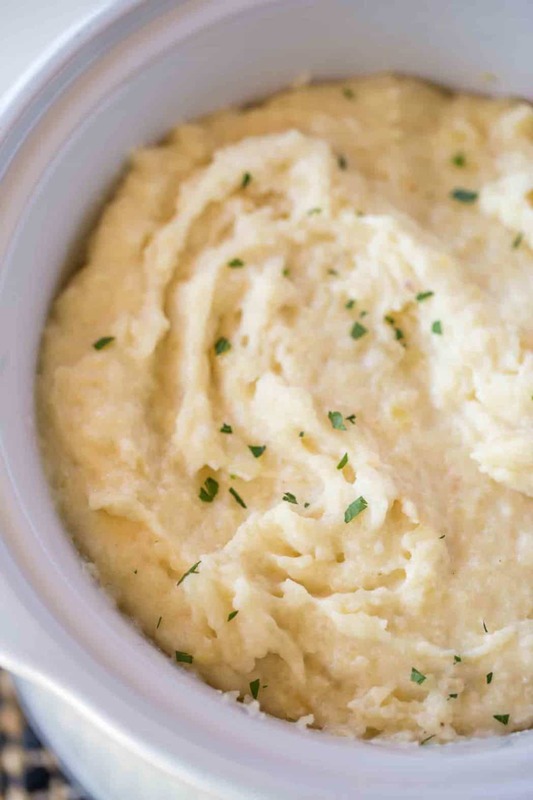 Can you make mashed potatoes in a crock pot? Absolutely. 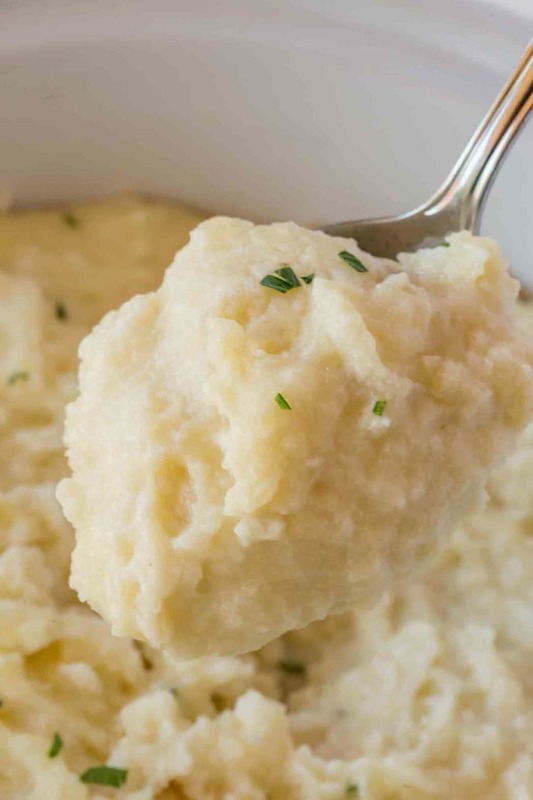 Crock Pot Mashed Potatoes are as easy as any other dump and cook meal. The hardest part is peeling the potatoes! How long can I keep mashed potatoes in a crock pot? I have successfully kept slow cooker mashed potatoes warm and covered during events for up to 4 hours before noticing any noticeable drying out. WHAT TO SERVE WITH MASHED POTATOES? Meat or Chicken, my favorite being this amazing Perfect, Easy Ribeye Steak or BBQ Pulled Chicken. Cook the potatoes in water instead of vegetable stock, then add in the rest of the ingredients once they have become tender (10-12 minutes) and drained. I also add a bit of heavy cream to make them extra luxurious sometimes. HOW MANY POTATOES DO YOU USE PER PERSON FOR MASHED POTATOES? Potatoes are heavier than they look, so account for half a pound of raw potatoes per person/serving when considering how much mashed potatoes you have to make. As a general rule bags of red potatoes are sold in 3lb. packages while russet potatoes are sold in 5 and 10 pound bags. Remember red potatoes won’t be peeled so you don’t lose the weight of the potatoes while russet potatoes will lose at least 5-10% of their weight in preparations. Immersion Blender or Hand Mixer: Make quick work of the potatoes this blender is my go to for blending soups and mashed potatoes. Add the potatoes, broth, salt and pepper to a 3 quart slow cooker and cook on low for 6 hours or on high for 3 hours. Add in the garlic, butter and sour cream. 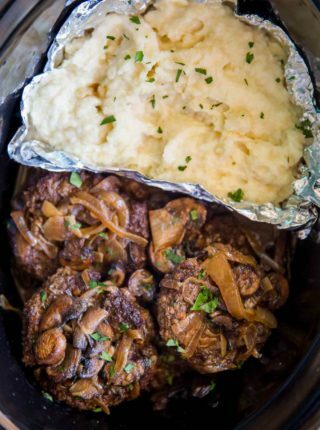 Mash with a potato masher or hand mixer and garnish with parsley if desired. I know, right?! A great way not to miss out on any of the flavor! Do you think this would fit into a 2 quart crockpot? It might make the slow cooker overcrowded and not cook evenly. I’ve only tested it using a 3 qt so I’m not sure if it would be ok or not. If you decide to try, I’d love to know how it turns out. Thanks! Can you use chicken broth instead of vegetable broth? I want to serve this with chicken. This looks like an amazingly timesaving recipe – we’re having about 25 for Thanksgiving. 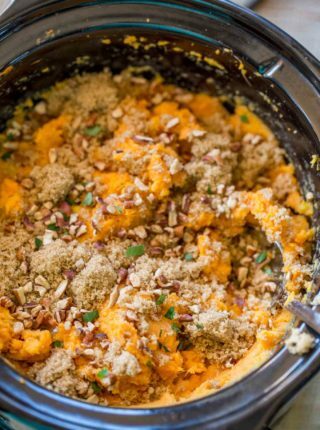 Would this recipe work well doubled in a 6qt slowcooker? Yes, this will be perfect! Enjoy!! I am curious. In your instructions it’s refers to red potatoes and russets, yet, in your recipe you use Yukon potatoes. Do you peel Yukon potatoes or leave them with the skin on? I peeled the Yukon potatoes. Enjoy!! Is it possible to add the nutrition information to the recipes? Hi. I just found this wonderful recipe. If all i have is a5 qt crock pot, would i make 1 and 1/2 times the recipe? Thanks. I couldn’t get the crock pot mashed potatoes or the 1 hour cinnamon rolls to print. I noticed that both of these recipes had the “print recipe” button in a different place than the Mongolian Beef and the Chipotle barbacoa Beef recipes, which printed with no problems. Sorry it took me a bit to respond to you but it looks like the issue has been resolved. I just tested both and was able to print with that button. Thank you for letting me know and sorry for the inconvenience. Do you drain off the broth from potatoes? No, no need to drain it. I think my husband needs to make this soon. Mashes potatoes is his mayor specialty so I am sure he will appreciate this easy take on the recipe! I didn’t know this could be so easy! I love any idea that frees up the stove around holiday time! These look delicious! Mashed potatoes are LIFE! These sound soooo good! This seriously looks unbelievable. I love mashed potatoes, and these are perfect. They’re so good!! You must try them!! I just love my slow cooker! It is so handy for things just like this! Definitely! Why not let it do the work for us, right?!? 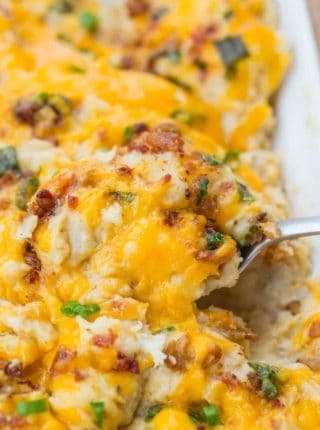 I love mashed potatoes and will definitely have to try this!